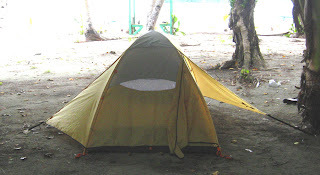 There is a wide array of camping gear and camping stove fuel available for purchase in Koror. Check out the second floor of the Surangel department store downtown. I rented the single person Camping Kit from Planet Blue kayaks. The equipment was in good repair except that they neglected to pack several items (and the dishwashing sponge was used.) INSIST that they do an equipment check out with you. Do not let them rush you out, do not accept doing a check-out on your starting island. It took them two days to get maps out to me. The day after my trip began they bought out my missing tiki torches (I was hoping for the tall Survivor "your torch is snuffed" ones) and shower (never used it). When I inquired about the maps the guys who bought out the torches said they knew nothing about the maps. I was almost in tears thinking that I would have to make the best of it without maps, from memory and wishing that I had bought the tourist maps that I had back at my hotel. Camping stove and fuel canisters - I tried to make a fire and failed miserably. Last year in Tonga I was able to build a huge bonfire, here everything was just too damp. Several cooking pots, a kettle, plastic bowls & a cup, carving knife, fork and a large spoon (you may want to take a teaspoon along yourself), cutting board. They also include a roll of toilet paper (and all the toilets outside of the Nikko Bay area had ample toilet paper), matches. Anchors - again this is advertised as included (with kayak rental) but they neglected to pack one for me. When I inquired about this on Ulong I was given a rope which I did use once to tie the kayak to a tree. Maps - (included with kayak rental) wonderful, detailed maps with snorkeling spots, beaches and currents indicated. Make sure you have them in your hands before you leave. Trash bags - all trash has to be taken out with you. You can ask boats that you encounter to take a bag with them to Koror. Still you will need a place to store your trash. I also filled my empty water bottles with trash that I could fit through the tops. At night if you store your trash in a bag you will need to hang it up so that nothing can get into it. A strong flashlight that you can read by. It gets dark very early. Gloves! Do they make kayaking gloves? I got blisters from clutching the paddles. I also took a snorkeling vest that I wore when I kayaked. It says on the vest that it is not to be used as a flotation device but I figured that something is better than nothing.